"Ambalal was born in Tarasali a suburb of the city of Baroda and raised in Bhadran, Central Gujarat. Although a contractor by profession, and married to Hiraba, his life at home and with the world was exemplary prior to his Self Realisation. After becoming Self realized and attaining the state of a Gnani, (The Awakened One, Jnani in Hindi) his body became a public charitable trust." "On a June evening in 1958 at around six o'clock, Ambalal Muljibhai Patel, a family man, contractor by profession, was sitting on a bench of a busy platform number three at Surat train station. Surat is a city in south Gujarat, a western state in India. What happened within the next forty-eight minutes was phenomenal. Spontaneous Self-realization occurred within Ambalal M. Patel. During this his ego melted totally and completely. From that time onwards he became completely detached from all thoughts, speech and acts of Ambalal and he became a living instrument of The Lord for salvation of the world through the path of knowledge. He called this Lord, Dada Bhagwan. ', This Lord is fully manifest within me,' he told, to all he met. Furthermore he added that, ' the same Lord, Dada Bhagwan exists in all living beings. The difference between you and me is that in me, The Lord has expressed fully in me and in you he is yet to manifest. ' Who are we? What is God? Who runs this world? What is karma? What is liberation? Etc. All the world's spiritual questions were answered. 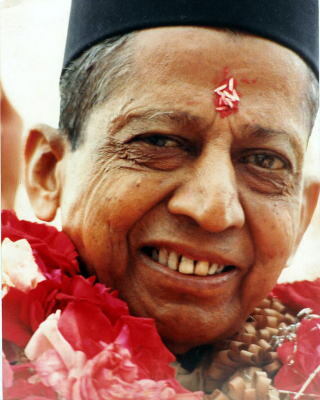 Thus nature offered absolute vision to the world through the medium of Shree Ambalal Muljibhai Patel." "I am personally going to impart siddhis (special spiritual powers) to a few people. After I leave, will there not be a need for them? People of future generations will need this path, won't they?" "For Self-realization, a Gnani Purush is needed. The Gnani Purush is able to dissolve your ego because he is completely devoid of ego." "The slightest element of �My� is an illusion." "Once the wrong belief that �I am the doer� is destroyed and the nature of the real doer is known, all our puzzles are solved." "All the religions of the world are correct by their viewpoint. The religion which investigates, �Who am I?� and �Who is the doer?� is the final religion. This is the absolute religion. Absolute religion imparts liberation."